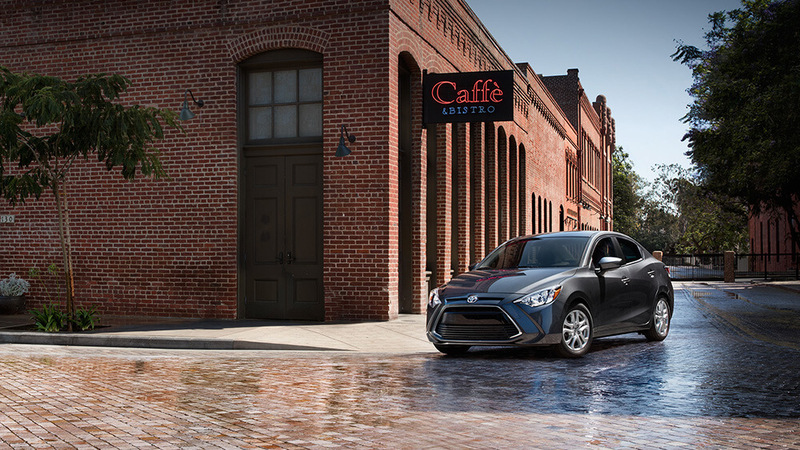 The all-new 2017 Yaris iA joins the Toyota lineup to provide drivers with a whole new flavor of compact performance. 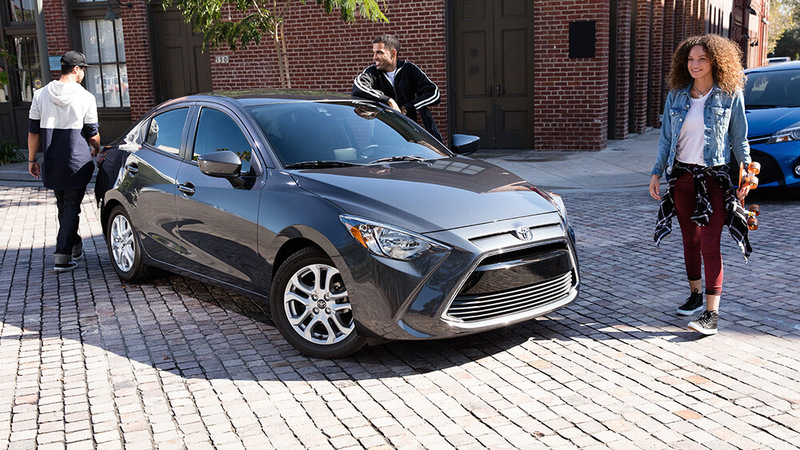 As the manufacturer’s smallest sedan, it manages to unite everything you’d love about a true subcompact with the space and features familiar to those behind the wheel of mid-sized sedans. Starting at either $15,950* with a 6-speed manual transmission or $17,050* with a 6-speed automatic transmission, the 2017 Yaris iA presents a score of first-rate features as standard, including power windows with LED turn signal indicators, remote keyless entry with push button start, connected services suite with Pandora, Daytime Running Lights (DRL), and an integrated camera. 6-Speed Manual: Achieves up to 30 mpg in the city and 39 mpg on the highway**. 6-Speed Automatic: Makes up to a phenomenal 32 mpg in the city and 40 mpg on the highway**. Passenger Space: With up to 85.9 cubic feet of passenger space, the iA feels open and inviting, even with all seats filled. Cargo Space: Need to take a couple of suitcases or a huge load of groceries? 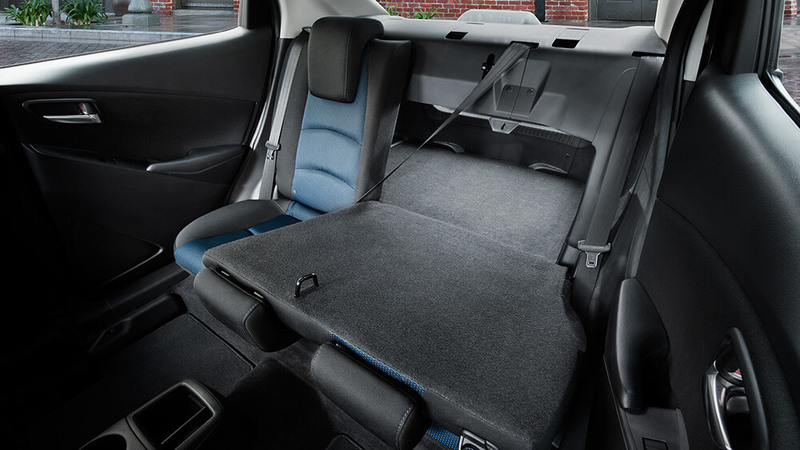 The Yaris iA will manage with space to spare thanks to up to 13.5 cubic feet of storage room. You can even extend that cargo area into the back using your standard 60/40 split fold-down rear seats. Large rotary climate-control knobs make it easy to keep yourself cool during the hottest days, while a touchscreen infotainment system allows for effortless control. You’ll also benefit from the perfectly sculpted support of sport-contoured seats. The interior of the 2017 Toyota Yaris iA is rich in features as well as generously sized. Here are just a few of its standard and available features and accessories. 7-Inch Touchscreen Display Audio: The Yaris iA comes standard with a high-resolution touchscreen, allowing for quick and effortless control over your interior environment. If you prefer, there’s a row of large, responsive buttons to use instead. Remote Keyless Entry with Push Button Start: Use the key fob to lock and unlock your Yaris from afar. Once inside, you can keep the fob in your pocket, purse, or bag, then fire up the engine via the Push Button Start function. Universal Tablet Holder: If you need to take the kids to the beach or out to a theme park, let them relax through the commute by watching TV shows and movie on their tablets. The iA offers a universal holder that keeps the tablet attached to back of the front headrests, just like on a plane. 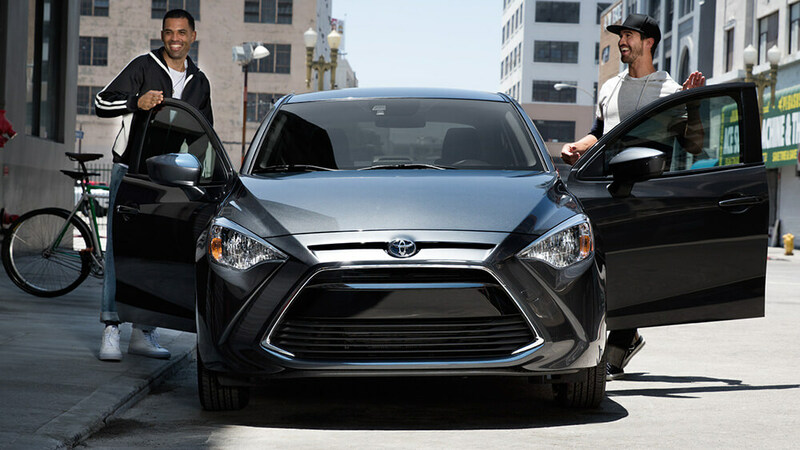 Whether you’re commuting from Culver City to Los Angeles or heading from Santa Ana up to Long Beach for a day in the sun, the 2017 Toyota Yaris iA is going to work wonders. To find out more, take a closer look, or arrange a test drive, just pay a visit to Marina Del Rey Toyota today. *MSRP excludes the Delivery, Processing and Handling Fee of $865 for Cars, $940 for Small/Medium Trucks (Sienna, RAV4 Hybrid, Highlander Gas, Highlander Hybrid, 4Runner and Tacoma), $1,095 for Large SUVs (Sequoia, Land Cruiser), and $1,195 for Large Truck (Tundra). (Historically, vehicle manufacturers and distributors have charged a separate fee for processing, handling, and delivering vehicles to dealerships. Toyota’s charge for these services is called the “Delivery, Processing and Handling Fee” and is based on the value of processing, handling and delivery services Toyota provides as well as Toyota’s overall pricing structure. Toyota may make a profit on the Delivery, Processing and Handling Fee.) Excludes taxes, license, title and available or regionally required equipment. Actual dealer price will vary. ** 2017 EPA-estimated city/highway mileage. Actual mileage will vary.